If you’ve done all or part of your grocery shopping by now, you deserve a medal. Now it’s time to assess what can be prepared early. Start by sorting your fridge because there’s no doubt it’s overflowing. Separate your vegetables, fruits and meats. Then go through each category and see what can be done early. For instance, chop your vegetables and coat them in oil to avoid browning. If you’re making your own breadcrumbs for stuffing, do it now and freeze them in a bag. Chop nuts for recipes that need them and store them in airtight containers. Prepare salad dressings and sauces that will keep for a few days in jars. Basically, look at all of your recipes to see what steps can be done days in advance – you’ll be surprised how many there are. Christmas morning goes so fast that my debate is whether to shave the ham or my legs (not where to position figurines on the table). So why not make it a ritual to set the table while watching Carols by Candlelight on Christmas Eve? First lay the plates, cutlery, glasses and napkins. Then put all of the platters on the table with the bags of lollies, chocolates, nuts and glace cherries in them – all you have to do is open the bags in the morning. Then spend some time putting some nice decorations on the table – bonbons, leftover tree decorations, candles or a vase with some greenery from the garden. Voila! It’s good to have a visual of the dishes you’ll be serving so you can map out what needs to be cooked and what it’s going to be cooked in. Most of us only have one oven, but I’m guessing most of us are also unrealistic in our expectations of how much can fit in there… This is when you may also realise you don’t have the appliance you need for a dish that you’ve chosen because the photo of it looked ah-mazing. Give yourself the best chance of cooking everything perfectly. If you’re oven space is limited, help it out by parboiling your potatoes, sweet potatoes and pumpkin first. If you want to go one step further, you can even roast them until they’re nearly cooked and then finish cooking them just before the meal. For those already shaking their heads, let me tell you that I’m a perfectionist so the word ‘delegate’ sounds like nails on a blackboard to me. However, the reality is that if you insist on doing everything, you’ll spend the entire day being a hot sweaty mess in the kitchen on the one day you’ve been looking forward to all year. And you’re crazy if you think that the champagne, those rum balls and all the other fancy hoo-ha that you made will be around when you’re ready…think of the blood, sweat and tears you put into that jolly gingerbread house only to have the children what….pull apart, lick the lollies and put them back?! If there’s one day of the year to delegate, it’s Christmas Day. You know why we look forward to Christmas all year? Because it’s family time, it’s friend time, it’s food time, it’s cocktail time! Take a minute to remember what you envisioned Christmas this year to look like and make sure you follow through on it. Relax. Enjoy. Celebrate. Wishing you a very merry Christmas from everyone here at L & M Gold Star! In 2017 our blog will bring you lots of cooking inspiration, home appliance information, refurbishment tips and more! In the meantime, we’d love you to come to our showroom to see our appliances. We are located at 2584 Gold Coast Highway, Mermaid Beach QLD and we are only closed on public holidays over the new year. Keep the above quote in the back of your mind until you finish reading okay? It’s part of my punchline! For me, Christmas is the most exciting time of the year. I can hardly wait until the 1st of December (ok fine, late November!) to put the tree up and hang the fairy lights. I start my shopping months before Christmas just because I love dragging out the festive feeling. I listen to Christmas carols while wrapping presents and as I sit in my lounge room every night looking at the lit up tree, I can’t help but feel overwhelming love and thankfulness for my family and friends. Christmas is a time fuelled by sentiment – it’s meaningful, it’s happy, it’s optimistic. The holiday season is about giving, sharing, celebrating and loving (but heaven forbid our loved ones to expect us to say the same things in person as we do in a card!). Every year however, I can’t help but think of those who don’t feel the same way about Christmas as me. For some people, it’s sad, or stressful, or lonely. Some have lost loved ones recently, or the memory of long lost loved ones detracts from the festivities. Some are struggling financially and the pressure to buy gifts and nice food with all the trimmings is just too much. Some are battling with an illness themselves or of a loved one. Some have family who are away or live elsewhere. Some are segregated from their families simply because of who they are (you know, that one, the black sheep) or because family conflicts haven’t been resolved in time, or never will be. Hek, some mums are just so exhausted by the end of the year because they’ve been doing everything for others and not for themselves (even though it’s bikini season and those legs are in need of shaving!). And hey, let’s not forget about our teeny boppers who worked their arses off all year to get into their desired university course, but have fallen short with their exam marks (or done nothing, but hoped for 99.5 nonetheless…). This Christmas, I encourage everyone to not just spare a thought, but to actually do something for someone that you know that needs it (that’s right, I’m not just talking about donating to a charity because the Salvos guys are at the pub with a bucket). It doesn’t have to be expensive and it doesn’t have to take a lot of time; it’s just about showing that someone that you care. For those struggling for ideas, I have just the thing! Decide what you’re going to make (or what you’re going to buy and claim that you made) – whether it’s lobster or a Vegemite sandwich, it doesn’t matter! Apply a personal touch like some handpicked flowers in a vase (I’m not condoning “stealing” but if you don’t have flowers and your neighbour has lots……) or a balloon tied to the meal, or a tea light candle on the serving tray, or even your favourite photo of the two of you if you have one. Deliver the meal in person, tell that person that they’ve been on your mind and wish them a merry Christmas. Before entering the family business, I was a Social Worker working with children in foster care (the job that gives you a bigger heart but more grey hairs). I have a good friend who used to leave single tea bags on my desk with a post-it note on them – sometimes just with a smiley face drawn on it, sometimes with a short message. What cost sometimes only a few cents for my friend gave me something priceless – that single tea bag told me that I was thought of, loved and cared for. Now that my friends, is the sentiment that you can leave someone with this Christmas that will last well beyond Christmas Day and the New Years celebrations that follow. Here at L & M Gold Star, we’re about more than kitchen appliances – we have a passion for cooking and believe that food brings family and friends together in a way that other things can’t. Always remember that “food is symbolic of love when words are inadequate” – that one simple meal you prepare with thought for someone may mean the world to them. Whoever said that the way to a mans heart is through his stomach was only half-right – it’s the way to everyone’s heart! (think how much males and females alike love the taxi driver who takes them through Drive Thru on the way home from the pub). Merry Christmas all… May it be the best one yet! Growing up, my mum cooked meat well done, and then cooked it some more. My husband, on the other hand, will eat his steak even when there’s not enough doubt about its’ ability to get up and walk off the plate. The way we like our meat is a very individual thing, but the fact is that cooking meat can turn the very best of us into a psycho; a revolving door with a different emotion at each turn. 1. You spend an age on recipe websites. You cull the recipes with ingredients you’ve never heard of. Then you cull the ones that use fahrenheit and ounces. Next comes the ones that reference the level of difficulty as being 4 or 5 stars. The difficulty is that you’re now left with recipes that rely on butter and cream to taste good, or that are so simple they rely on you actually being able to cook to make the meat shine. 4. You start prepping your animal. You herb it, oil it, stuff it, tenderise it – whatever lights your candle. You fight the urge to coat it in every herb and spice, but restrain yourself thinking “no, the recipe knows best.” (I lie, I always add something extra for good measure). 5. You shove it in the oven with a smile. You’ve got hours till your guests arrive, and you honestly contemplate applying for next years Masterchef. 6. You know the meat will take hours, but you defy logic and check it every 10 minutes. You have absolutely no idea what you’re looking for, but just looking makes you feel like you’re cooking. 7. Your paranoia increases. What if, in an unprecedented way, your 3kg lamb roast goes from raw to overcooked in 45 minutes?! You start checking the oven every 5 minutes, all the while still knowing you have no idea what bloody colour that meat is on the inside. 9. It’s time to get dressed. You get yourself looking fabulous and then you set the table. You put some music on and pour a wine (ok fine, the wine was opened when cooking started). 11. The oven timer goes off. IT’S TIME. You open the door, grinning from ear to ear as you pull your pride out of the oven to rest. But the next 10 minutes have you questioning the need to do a nervous poo or have a Xanex. You settle for a wine refill. 13. You spend the entire meal apologising for how meat the tastes. You blame the oven. You blame the butcher. You blame the recipe. And then you resolve to cook your guests the best damned vegetarian meal they’ve ever tasted for the next dinner party. Moral of the story? Take the guessing out of cooking with a food probe. Simply set the desired internal temperature, shove the probe into the meat and walk away. From rare to well done, the food probe has you covered, literally to the enth degree. Many of our ovens come with food probes, including Asko, AEG and Vzug. Watch this quick 45 second video to find out more about the probe. This article written by House & Garden explains why energy efficient appliances are worth investing in. Better for your wallet, better for the environment and made using technology that is smarter and more durable than ever before – what’s not to love? We carry a number of energy efficient appliances including washing machines, dryers, fridges and induction cooktops. Visit us today to find out energy consumption and savings information for specific appliances. Size Matters… And We Are Big. The front of our shop may give the impression that our showroom is small…. but our premises actually takes up a whole large block. And don’t stress about finding parking on the street, we have a carpark out the back just for our customers. We have enough stock in our showroom to rival even the biggest retailers – ovens, cooktops, fridges, rangehoods, washing machines, dryers, TV’s, InSinkerators, Zip Taps, mixers, sinks and more. For a small business, we have big benefits. But don’t take our word for it – come and size us up for yourself. This recipe is in the ‘Top 50 Highest Rated’ recipes on Taste.com.au. Cooking this in one of our combi-steam ovens would take the flavour and texture to another level – crunchy crackling with nearly all the moisture retained in the meat…. Heaven!!! Score the pork belly skin at 1cm intervals. Place the pork on a rack in a roasting pan, skin-side up. Rub 2 tablespoons of salt into the skin, then pour in enough water to fill the pan to just under the rack. Place in the oven and roast for 30 minutes or until the skin is crispy, then reduce the oven to 180°C and roast for a further 1 1/2 hours or until the meat is tender, topping up with water as necessary. Meanwhile, place the brown sugar, red wine vinegar and star anise in a saucepan over low heat and stir to dissolve the sugar. Simmer for 5 minutes, then add the chicken stock and simmer for 5-6 minutes until the mixture has reduced by half. Add the lime juice and continue to reduce for 3-4 minutes until the mixture is syrupy. Allow caramel dressing to cool slightly. To serve, transfer the pork belly to a board, carve into bite-sized cubes and arrange on a platter. 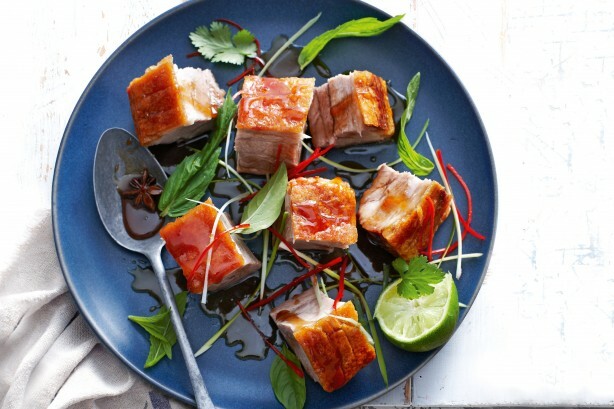 Drizzle the pork with the caramel dressing, then scatter with the mint, coriander, Thai basil, spring onion and red chilli. Serve with lime wedges to squeeze over. We’ve been air conditioning specialists for many, many years and if there’s something we can’t emphasise enough, it’s how essential air conditioning is for your investment property. Holiday makers are spoiled for choice with accommodation on the Gold Coast & Sunshine Coast… so what is it that makes people choose your property for their holiday? Yes, of course it’s the look of the place and the location, but a huge factor is comfort. We’re known for our hot, hot summers and one of the first questions holiday makers ask is “does the property have air con?” If the answer is no, you’ve likely lost income immediately to a similar property. This isn’t just in summer, it’s all year round (we are called the Sunshine State for a reason). From quotes to installation, we have you covered. Call our air conditioning specialist Simon Bright today on 0438 460 800. We now do bathroom & kitchen renovations! LME Refurbishments is a joint venture between two highly successful and long standing Gold Coast companies, Eximm and L & M Gold Star. For over 10 years Eximm and L & M Gold Star have maintained a strong and mutually beneficial working relationship in the marketplace with Eximm holding solid experience in the building sector and L & M Gold Star being are an electrical appliance retailer, wholesaler and bathroom product supplier. Due to client demand, the CEO’s of both companies have agreed to come together in a way that would provide clientele with a more simplistic approach, fully managed projects under one roof that in turn create a bigger offering to the marketplace at a highly competitive price. LME Refurbishments offer unit/apartment renovations including all aspects of design and installation with a particular focus on kitchens and bathrooms. One business under the one roof delivering multiple solutions. Call us today on 5592 3344!